· Multiple layers with support for in-editor parallax. · Each layer can be a different size and be resized at any time. · Multiple tile pages can be loaded at once. With duplicate tiles being stripped at export time. 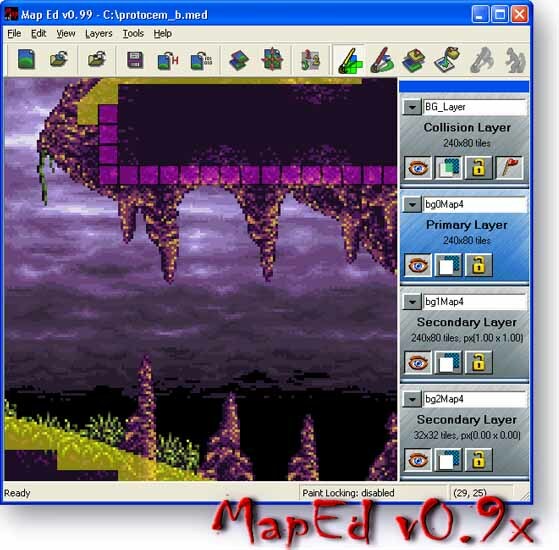 · Copy and paste from any layer to any layer in the main map window. · Multiple levels of zoom for both the map workspace and the tile viewer. · Tiling paint brush ability. · Collision layers and Flag painting. · New v0.95 Import Layer from .bmp. · New v0.96 .H Export Customizer. · New v0.97 Undo support. · New v0.97 Export Layer to .BMP. · New v0.97 PCX and 16 colour .BMP support. · New v0.98 Updated User Interface. · Coming soon Object placement tools. · Coming soon Detail Brush Mode. MapEd is free for non-commercial use, though, if you are using MapEd and like the tool, perhaps consider making a voluntary donation? Note: Making a donation is not a replacement for acquiring a proper license for commercial usage.